Protects against cardiovascular disease, improves brain function, and aids in the absorption of thiamine by the liver and vitamin A by intestine. It is also known to promote energy and is needed to help repair damage to the liver caused by alcoholism. 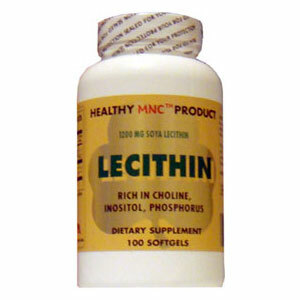 Lecithin enables fats, such as cholesterol and other lipids, to be dispersed in water and removed from the body. The vital organs and arteries are thus protected from fatty buildup. Lecithin is a type of lipid that is needed by every living cell in the human body. Cell membranes, which regulate the passage of nutrients into and out of the cells, are largely composed of lecithin. Lecithin is a type of lipid that is needed by every living cell in the human body. Cell membranes, which regulate the passage of nutrients into and out of the cells, are largely composed of lecithin. The protective sheaths surrounding the brain are composed of lecithin, and the muscles and nerve cells also contains mostly of vitamin choline, and also contains mostly of vitamin choline, and also contains linoleic acid and inositol. Although lecithin is a lipid, it is partly soluble in water and thus acts as an emulsifying agent. This is why many processed foods contain lecithin. This nutrient helps to prevent arteriosclerosis, protects against cardiovascular disease, improves brain function, and aids in the absorption of thiamine by the liver and vitamin A by intestine. It is also known to promote energy and is needed to help repair damage to the liver caused by alcoholism. Lecithin enables fats, such as cholesterol and other lipids, to be dispersed in water and removed from the body. The vital organs and arteries are thus protected from fatty buildup. Lecithin would be a wise addition to anyone’s diet. It is especially valuable for elderly people. Anyone who is taking niacin for high serum cholesterol and triglycerides should also include lecithin in his or her program. Most lecithin is naturally derived in certain foods such as egg yolks and soybean oil. Lecithin comes in liquids, granules, and capsules. Taking one 1200 mg capsule before each meal helps in the digestion of fats and the absorption of fat-soluble vitamins. Other ingredients: Gelatin (Bovine Source) Natural Glycerin and purified water. Prevent arteriosclerosis, protects against cardiovascular disease, improves brain function, and aids in the absorption of thiamine by the liver and vitamin A by intestine. It is also known to promote energy and is needed to help repair damage to the liver caused by alcoholism. Lecithin enables fats, such as cholesterol and other lipids, to be dispersed in water and removed from the body. The vital organs and arteries are thus protected from fatty buildup. Take 1 to 2 softgels daily with meals or as directed by your physician.